Don't be fooled by the name. 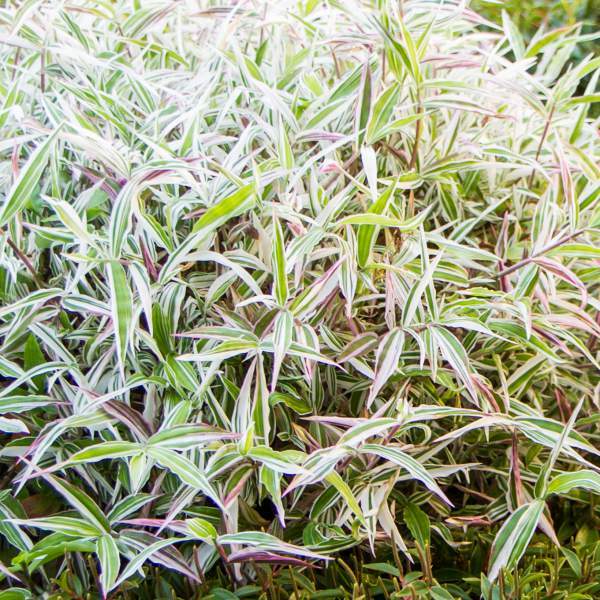 While looking remarkably like Bridal Veil, Basket Grass (also called Variegated Bridal Veil) is a true grass and is not in the Wandering Jew family. It has applications both as a retail houseplant and wholesale landscaping. Its ability to tolerate both hot and cold temperatures makes it a versatile product to have in your garden center. For best results with Variegated Basket Grass, we recommend using a constant feed program of 150-200 ppm N. Allowing the plant to dry out moderately between watering will help to create a pink hue in the leaves. Be careful not to overwater your Basket Grass. Maintain a pH between 5.5-6.5. Variegated Basket Grass is a sport mutation and therefore will revert back to green. You will need to remove any stems that are reverting in order to keep a nice-looking product. This plant is also a fast grower, so pinching and trimming will be necessary in order to create the desired size and shape. Space pots as needed to allow air flow and penetration of light between plants. An average pot will need to be spaced at 2' centers, but Variegated Basket Grass grows fast so, allowing for extra time, a grower could produce a large pot. At that point, 3' spacing makes more sense. Plant growth regulators are not recommended for Basket Grass. The plant will get tall and leggy if allowed, but trimming and growing in bright light are preferred over PGRs. Whiteflies are the biggest pest problem with Basket Grass. Variegated Basket Grass is not prone to many diseases, but don't oversaturate the soil. Due to its dense foliage, fungus could be a problem. Grow it in bright light and well spaced to help prevent problems. If the plant sits in moist soil for an extended amount of time, you could end up with root rot or botrytis. Botrytis grey rot is usually associated with wet or humid conditions. You can prevent botrytis by allowing the plant to dry out between waterings, allowing for good airflow in your greenhouse, and spacing to allow the sun to penetrate to the soil level. The most common chemicals used to treat botrytis and root rot are Medallion and Banrot. Use them as a drench according to each label's instructions. We recommend planting 4-5 starter plants per 10 inch basket. Use a well-drained soil in your baskets and plant your starter plants deep, allowing the ellepot to be completely covered by the soil. If you are planting 4 inch pots, 1 plant per pot should be sufficient. Plant it directly in the middle of your pot.